"I do what any thirty-year-old woman would do when told she is a guru. 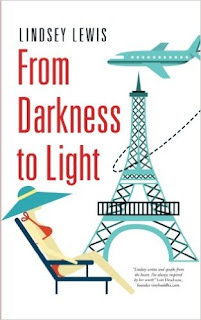 From Darkness To Light, a new memoir/spiritual guide/inspirational book by Lindsey Lewis, could have been just another story of a yoga girl and her cliche journey to self discovery. But, instead, it's lines like "I do what any thirty-year-old woman would do when told she is a guru. I start to cry," that set this book apart. Lewis once led a life many of us only dream of: a professional writing job at a popular magazine, invitations to gallery openings and fancy new restaurants. But beneath the glamour, Lewis knew she wanted more. And she was willing to give everything she had up to find what that more was. Of course she had to deal with anxiety and panic attacks, bad relationships and self doubt along the way. But on her path she also found teachers when she needed them and opportunities when she was ready for them. Oh, and her yoga mat always near by. From Darkness To Light is well written in a way that provides both hope and inspiration. Lewis's story is a great reminder to us all that when we get out of our own way and get quiet, we can find our own answers. From Darkness To Light can be purchased on Amazon and wherever books are sold.